A little Plank “Ceiling” | Welcome to the Creative Collage - Come In and Stay Awhile! So, this is a fix I am using right now to hide the holes and tie this area into the kitchen even though the upper cupboards are now gone. 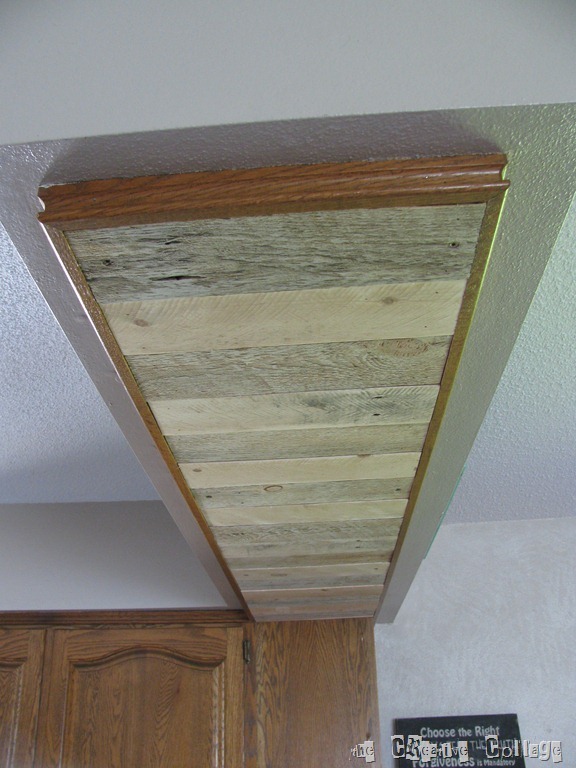 I used pallet wood (once again, I know – but it’s FREE) to make a planked ceiling effect where the cabinets used to be. My husband helped me hang this beast – boy was it ever heavy! 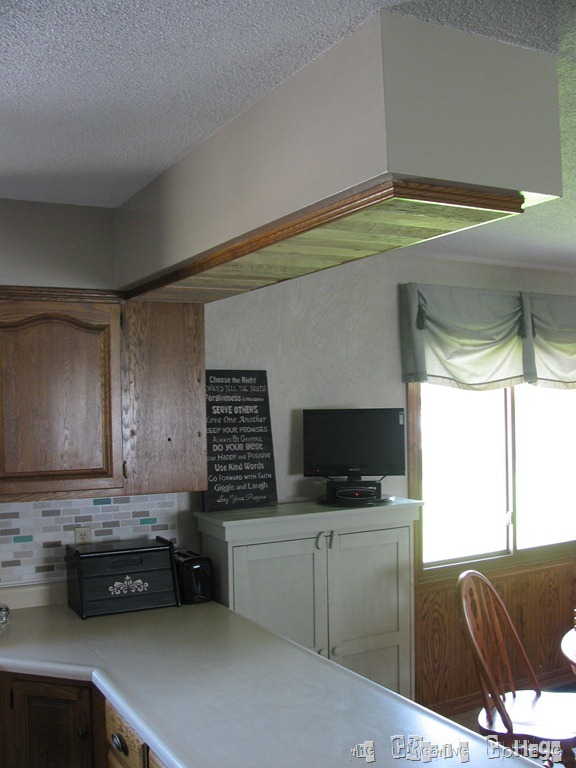 I used the trim that had been around the upper cabinets and tacked it around the planks. By making the planks the same size as the cupboards, I didn’t have to cut the trim and if I decide I really miss the cupboards I could put them back up! So – I’m just sort of playing it safe. I have not decided if I want to paint it the ceiling white, stain it or paint it a darker brown or just coat it with poly. I hope to work something up with pendant-type lights – on a budget of course! 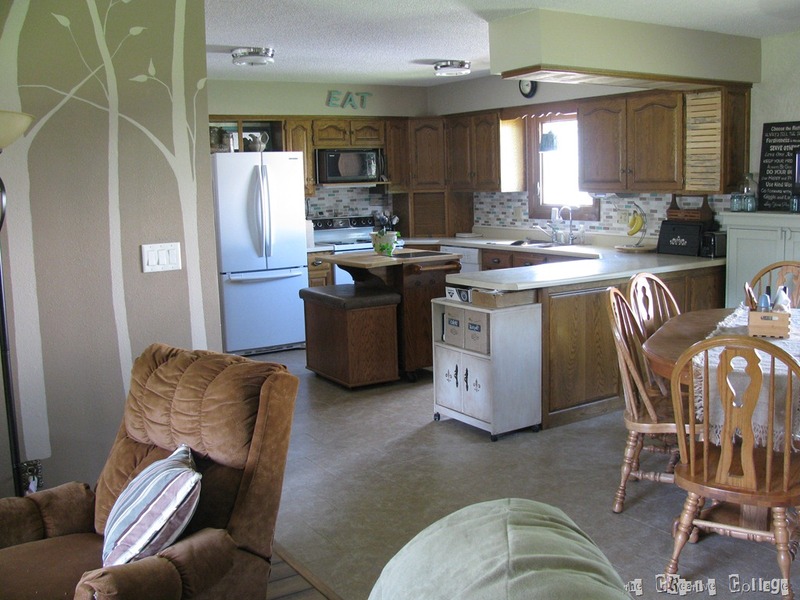 Finally – the whole open concept is a reality! This entry was posted in Home Decor, Remodeling, Woodworking and tagged Pallet, planks by Jo at theCreativeCollage.wordpress.com. Bookmark the permalink. A Cute way to incorporate the space under the extended counter is to put two small shelves and use it to store your cookbooks.